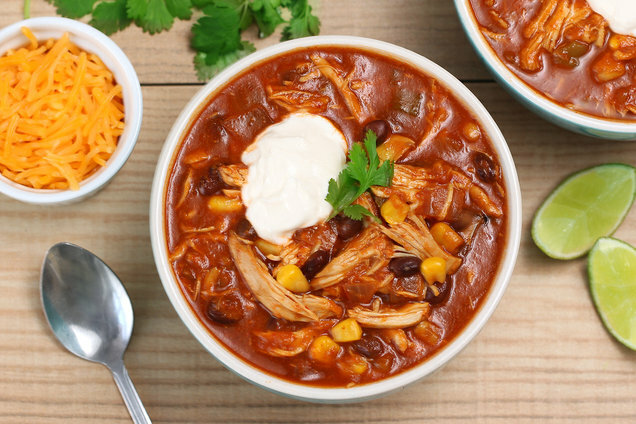 Combine all ingredients except chicken in a slow cooker. Mix until uniform. Add chicken. Cover and cook on high for 4 - 5 hours or on low for 8 - 9 hours, until chicken is fully cooked. Return chicken to the slow cooker, and mix well. It’s the Great Pumpkin (Episode), Hungry Girl! ⭑ Chew & Tell: We try a whopping NINE pumpkin products from Trader Joe’s, and not all earn our seal of approval. ⭑ Unexpected Ways to Use Pumpkin: From the sweet to the savory. ⭑ The Most Popular Hungry Girl Recipe of All Time: Just TWO ingredients! Click to listen, and subscribe for the latest episodes! Hungry for More Slow-Cooker Chicken Soup? October is National Pork Month, so here's another delicious slow-cooker recipe: our Pork Tenderloin Green Chili! Click "Send to a Friend," and pass this recipe along to all the slow-cooker collectors in your life!